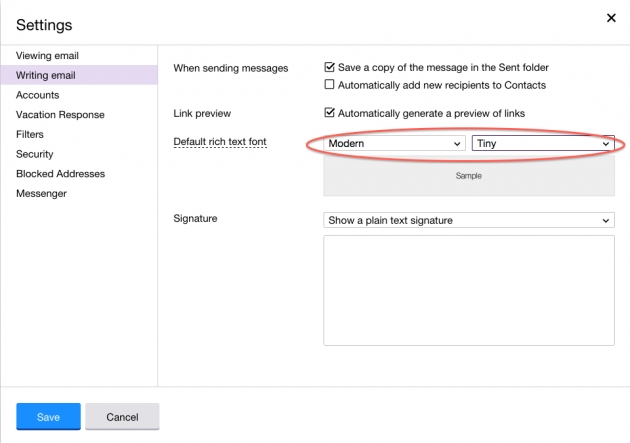 Every Yahoo Mail user should check this setting immediately | BlackBerry Blast! Do you use Yahoo Mail? I do. I've been a Yahoo Mail Plus customer for over a decade. I moved my main accounts to other services, but I still use Yahoo Mail for some things. A few days ago, I noticed mail I received from Yahoo Mail users had incredibly small fonts. It was insanely small to read on my Mac, but even worse on my phones. I immediately went to Yahoo to look for a way to submit feedback, but sadly they have done away with feedback for issues like this. Most of their feedback forms go to their "community" where frustrated user's questions are often left unanswered. My next step was to search the settings in Yahoo Mail. I found something quite interesting. As you can see in the picture above, my default rich text font setting was set on "Tiny." I sent a few test messages to myself and the font was in fact, tiny. How did that setting get changed? I have no idea, but it changed for everyone I know that uses Yahoo Mail. I changed my setting to "medium" which means anyone I send an email to will get a reasonable font. But, what about all the people who are unaware that the setting has been changed? All of the email I read from Yahoo is insanely small now. I hope Yahoo figures this out very soon! If you use Yahoo Mail, click on the gear in the top right, and go to Settings. Look for the "writing email" link on the left, then the "default rich text size" option. Set it to something other than Tiny!